Most people over the age of forty have heard of Bobby Sands. Anyone who was in Ireland in 1981 saw the media’s vigil of Bobby Sands’ hunger strike, a vigil that lasted sixty-six days before Sands’ body finally gave out. One of several dozen IRA militants serving sentences in Belfast’s high-security Maze prison, Sands was the first of ten men to starve themselves to death as a final act of protest against the British government’s treatment of the IRA’s members in prison; the government considered the IRA to be a band of criminals rather than a legitimate resistance movement, and had refused their demands for political status. Hunger is the recreation of that protest in all its awful, physically tormenting agony, and as such, a memorial to one man’s journey towards self-torture, suicide and martyrdom as a political act. Hunger is also an eerily beautiful film, a strange confluence of contrasting images that remind us of both heaven and hell, and that together somehow leave us awestruck. Directed by, or perhaps I should say constructed by, visual artist Steve McQueen, it’s a severely formalist experience. There is almost no dialogue, and scenes are more like visual tableaux than strips of a plot. McQueen chooses to concentrate on the purely physical aspect of the prisoners’ lives, and so the film is almost empty of drama. We see dirty, naked men being manhandled by stern-faced guards, dark cells smeared with excrement, and prisoners dumped in bathtubs and scrubbed with mops. The air is thick with the strained silence of pent-up tension and oppression. For the historically uninitiated, many of the precise, almost hyperreal re-constructions of prison life are confusing in their lack of exposition, and the effect could be seen as borderline propaganda. It is easy to construe the horrendous conditions the prisoners are living in as the result of mistreatment by the guards, a form of punishment through degradation. But the evidence is misleading; we have been plopped right in the middle of a prison protest, the inmates have refused to wash themselves or dress in prison uniforms—the so-called “blanket protest” that preceded the hunger strike—and these naked, shaggy men are living in their own filth by choice, not by force. By the time this is made clear, our sympathies already lie with the inmates. We even begin to see their acts of self-deprivation as a strange form of asceticism, a grand gesture of submission to a higher purpose. The prisoners are like apostles, and Bobby Sands is their Christ figure. To McQueen’s credit, the prison guards are not depicted as evildoers, but as working men clocking in to do their job, a few of whom cringe at what is ordered from above. McQueen focuses in particular on one guard, who is assigned to beating the prisoners, and here, too, the director concentrates on the purely physical. The guard washes his knuckles that are raw from beatings, eats his bangars and eggs, goes to work where his knuckle sores reopen, and takes a cigarette break alone. Stripped of drama, the guard’s purely physical actions become robotic deeds drained of emotion. The guard is himself imprisoned in his own role as a servant of the state. In the end, however, Hunger’s main purpose is to memorialize Bobby Sands’ ultimate act of sacrifice, and such intent doesn’t require historical accuracy. And yet, the film does take time to explore the ambiguities of the ethics and psychological motivations behind the act, and by extension, the very nature of resistance and commitment. This comes in a conversation between Bobby Sands and a parish priest, whom Sands has asked to come and, in effect, bear witness to his decision to start the hunger strike. In stark contrast to the rest of the film, McQueen films the conversation in a single take that lasts 20 minutes, an eternity in cinematic time. The debate between man and priest is a brilliant slice of acting and writing, and is McQueen the visualist’s nod to the power of both. In a rush of words, the two actors— Michael Fassbender, who plays Bobby, and Liam Cunningham as the priest—return quips in quick succession, like the intense volley of a tennis match. This lengthy exchange does much to finally appease our craving to know something about the character of the man behind the politics, and to bring life and humanity to an otherwise subdued, silent, almost static enterprise. As much as Mr. Fassbender captivates us in his verbal delivery, it is his body that is his most eloquent means of expression. Hunger’s long, final sequence meticulously recreating the process of Bobby Sands’ deterioration from starvation is filmed in excruciating detail, and in grave, ritualistic tones that make it seem almost like a religious ceremony. 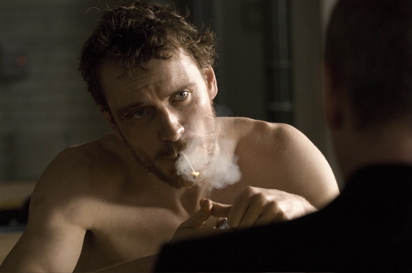 To get a realistic depiction of that process, Fassbender agreed to lose a massive amount of weight, and his emaciated body and cavernous face are the tools that fuel our emotional engagement, our recoil and our fascination. Much like Bobby Sands gave his life for a cause, for his country, Michael Fassbender has offered his body for another cause, for his art. As witnesses to both, one a sort of transubstantiation of the other, we can’t help but be transported by this acceptance of suffering. Much like Christian believers, I would guess, during a Passion play. Hunger is an intense moviegoing experience, one that will leave you both drained and uplifted. It’s an important film and, I think, an essential film. Whatever your politics, whatever your ethics about armed resistance, Steve McQueen’s visual legacy of the sacrifice Bobby Sands and nine others made for their land and their people is a moving testament to the human capacity for loyalty, our sense of community, and our capacity for dignity even unto death.